This is a Scotch blend from Duncan Taylor of 50% malt and 50% grain that is aged for 30 years in ex-sherry oak casks and looks to be a batch from March 2009 (065 09/065 12:31… someone let me know if I’m reading that code incorrectly). 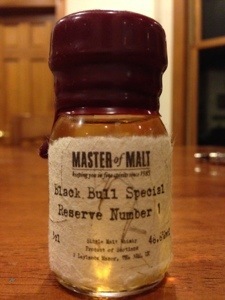 I’ve had a dram from this particular bottle before and really enjoyed it. At our last tasting, my friend offered me the last pour from the bottle to take home and I thankfully accepted. The nose is great with a bit of honey, cigar box, straw, dark plum, cherry, overripe banana, candied ginger and butterscotch. It’s a nice mixture that doesn’t overpower, but draws you in to discover everything that’s there. It’s more inviting with a bit of finesse rather than being bold. The invitation seems to be to take a sip…. The first sip immediately reveals the sherry influence with the same dark cherry, plum, vanilla, honey, ginger, lemon drop, straw, overripe green apple and lemon zest. The finish is long with a lingering leathery, overripe stone fruit profile. There’s not much spice besides the ginger and the wood is delicately revealed without any tendency to overpower the other flavors. As I continue to sip, the fruits become more evident and so does the spicy ginger and a bit of black pepper, even while the leathery influence of the wood rises up to offer the needed balance. Despite all the fruit flavors, it avoids any shift towards sweetness and provides a nice experience of overripe fruit, dark stone fruit, candy, spice and mild leathery wood. I definitely wish that I had more of this, but it’s now gone. I highly recommend this whiskey if you ever have the chance to taste it or by some miracle you happen upon a bottle to buy (and aren’t deterred by the price). This is the best Scotch blend that I’ve had to date by a significant margin. Posted in Whiskey. 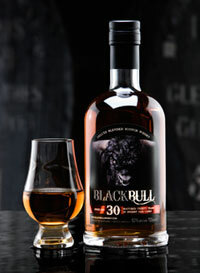 Tagged Black Bull, Blended, Duncan Taylor. Graham cracker, toffee and maple syrup aroma with a gentle charred wood in the background… very noticeable at first, but mostly distant after collecting some air. The taste is a metallic citrus with plenty of burn. The citrus is joined by ginger, maple and caramel as the metal fades, but the burn lingers as the aftertaste turns to leathery vanilla. A bit of water tames this dram to a leathery maple and vanilla as the citrus becomes more in balance. The aftertaste becomes more sulfurous behind a lingering chewy burnt caramel. By the time I’m finishing this one off, I’m tasting more florals and lemon along with a spicy gingerbread. Posted in Whiskey. Tagged Black Bull, Blended.